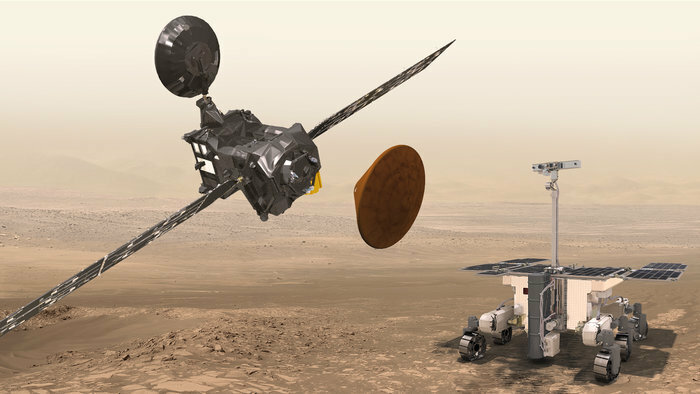 Artist’s impression of the Trace Gas Orbiter (TGO, top left) and the entry, descent and landing demonstrator module, Schiaparelli (middle), and the ExoMars rover (bottom right). Under the ExoMars programme, TGO and Schiaparelli will be launched to Mars in 2016, while the rover, along with a carrier module and surface science platform, will be launched in 2020. Schiaparelli is shown in post-separation configuration, encased in its protective heatshields. None of the components is to scale and in reality the orbiter will operate from around 400 km above Mars. On 14 March 2016, the Roscosmos State Corporation and the European Space Agency (ESA) launched the jointly-developed ExoMars 2016 interplanetary mission, comprising the Trace Gas Orbiter (TGO) and the Schiaparelli lander, on a Proton rocket from Baikonur, thus marking the first phase in the European-Russian ExoMars cooperation programme. The success achieved by Russian and European experts involved in ExoMars 2016 is the result of long and fruitful cooperation. The ExoMars 2016 spacecraft are due to arrive at Mars in October 2016. The second ExoMars mission involves a Russian-led surface platform and a European-led rover, also to be launched on a Proton from Baikonur. Russian and European experts made their best efforts to meet the 2018 launch schedule for the mission, and in late 2015, a dedicated ESA-Roscosmos Tiger Team, also including Russian and European industries, initiated an analysis of all possible solutions to recover schedule delays and accommodate schedule contingencies. The Tiger Team presented its final report during a meeting of the Joint ExoMars Steering Board (JESB) held in Moscow. Having assessed the possible ways to ensure successful mission implementation, the JESB concluded that, taking into account the delays in European and Russian industrial activities and deliveries of the scientific payload, a launch in 2020 would be the best solution. ESA Director General Johann-Dietrich Woerner and Roscosmos Director General Igor Komarov discussed the ExoMars 2018 situation. After considering the Tiger Team report and the JESB recommendations, they jointly decided to move the launch to the next available Mars launch window in July 2020, and tasked their project teams to develop, in cooperation with the industrial contactors, a new baseline schedule aiming towards a 2020 launch. Additional measures will also be taken to maintain close control over the activities on both sides up to launch. The successful implementation of both ExoMars missions will allow Russia and Europe to jointly validate cutting-edge technologies for Mars entry, descent, and landing, for the control of surface assets, to develop new engineering concepts and service systems that can be used by other Solar System exploration missions, and to carry out novel science at Mars. Both Directors General have reiterated their resolve to implement ExoMars programme successfully and step up Russian-European cooperation in Solar System exploration.